Since our girls trip to New Orleans last year, two of my lifelong childhood friends (Colleen and Deanna) and I have decided that each year around Halloween we are going on a trip together. 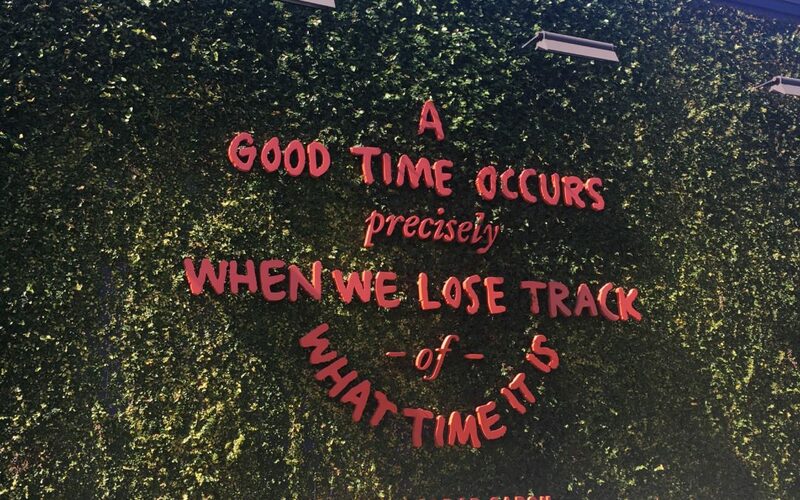 We have so much fun exploring and eating our way through new destinations. This year we chose to visit Colleen in Charleston! Colleen has lived there for quite some time so a trip to see her was long overdue. 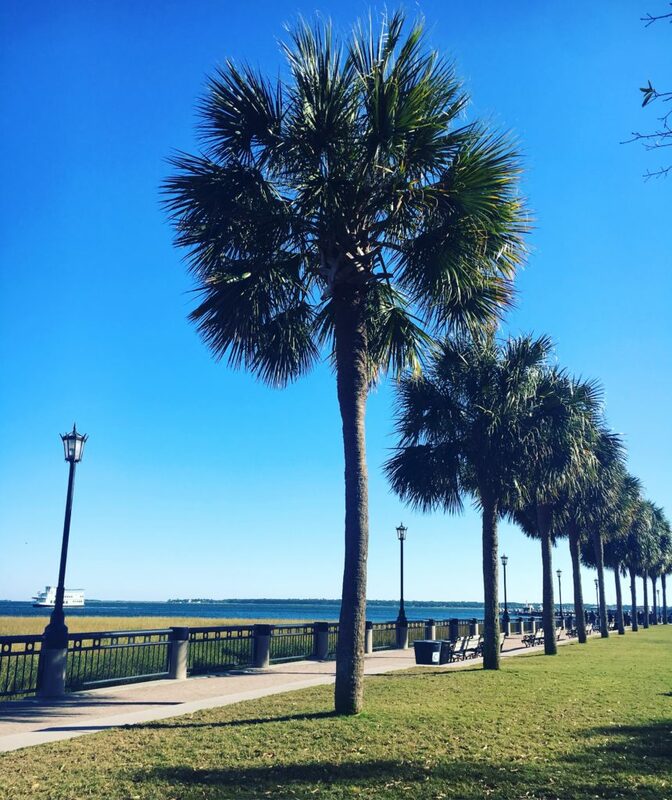 I had been to Charleston a handful of years ago so it was safe to say during this trip I really got to experience everything this beautiful city had to offer. By now, I believe that Colleen can officially be considered a local, she showed us all of the BEST spots! We flew out of Philadelphia directly into Charleston via American Airlines. The flight was super short; we agreed that we would do it again in a heartbeat. Colleen picked us up and we went to dinner shortly thereafter. 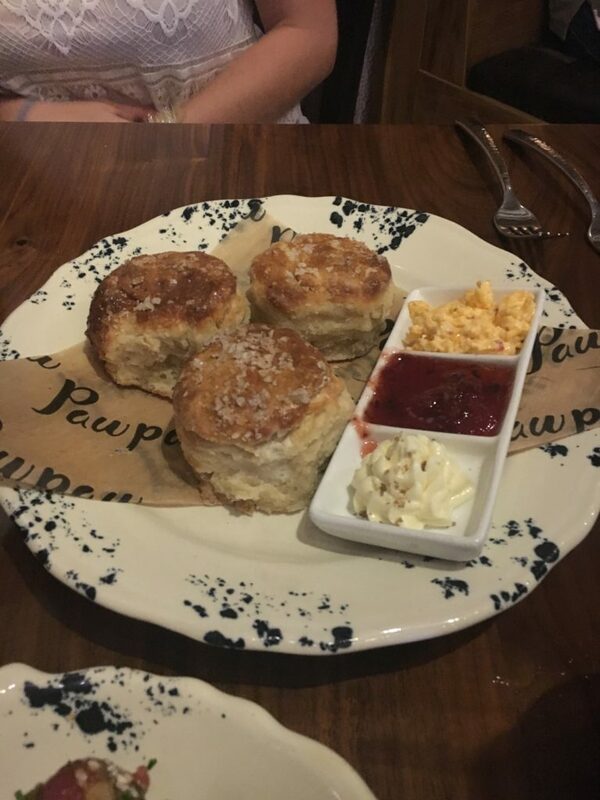 We enjoyed a fabulous traditional Southern dinner at Pawpaw. We were quite literally treated like royalty as dish after dish came out. The buttermilk biscuits, tuna tartare bites, fried brussels, and free-range fried chicken are all a MUST have. The cocktails were delicious and the ambiance was spot on. After dinner we headed across the street to Carmella’s as Colleen told us this was the best spot for something sweet. We were entirely too full from dinner so we opted for a cocktail and swore we would come back again to enjoy dessert. Everything looked so tempting! 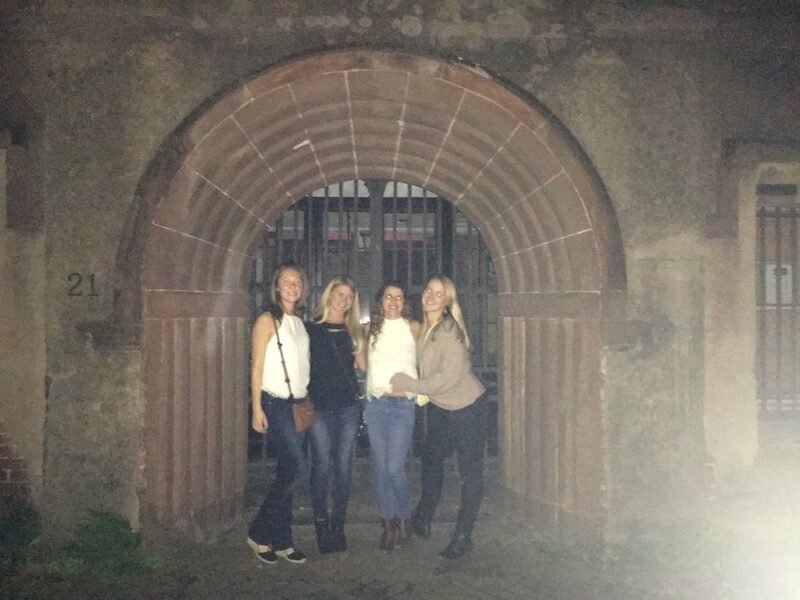 We hopped in an Uber and made our way to a Haunted Jail Tour through Bulldog Tours. If you are looking for something spooky and informative to do while in South Carolina, this is the tour for you. We walked through the levels of the Old City Jail and were given a ton of history as we kept experiencing strange things. I’m not big on surrounding myself by anything haunted or paranormal, so you can imagine how terrified I was as we did this. I think the girls got a good laugh out of how dramatic I was being. I did enjoy the history aspect of it as well as the fun of doing this around Halloween. We took a really cute picture after the tour and of course there’s an orb behind me, as I was the most terrified of the group! The night was still young so we headed to King Street for a drink at The Cocktail Club. I can’t recall the name of the drink we ordered, but it was spicy and delicious. I dare you to take a look at their cocktail menu and tell me it doesn’t sound appealing! There were a ton of fun looking places on King Street. If you are unsure of where to go, make your way there and just start walking. I guarantee that you will find something you like. Our next stop was Prohibition. The drinks were spot on, they had a DJ and the interior of the place was really cool. Our final bar hop spot was Warehouse. It was definitely worthy. 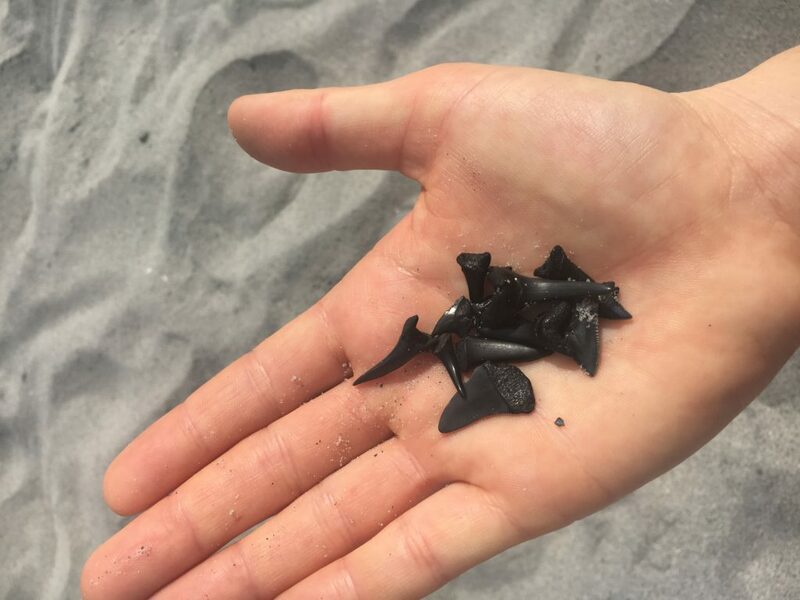 On Saturday we woke up and drove to Folly Beach to soak up the sun and hunt for shark’s teeth. As Colleen and I combed the beach, I noticed how clean everything was. I loved that the beach was filled with dogs running and playing in the water. It was so much fun to learn the tricks of finding the teeth. I left with an awesome handful, thanks to my sweet friend’s expertise! After the beach we went to Lost Dog Cafe for brunch. It was a super chill spot with some ride home about eggs benny. 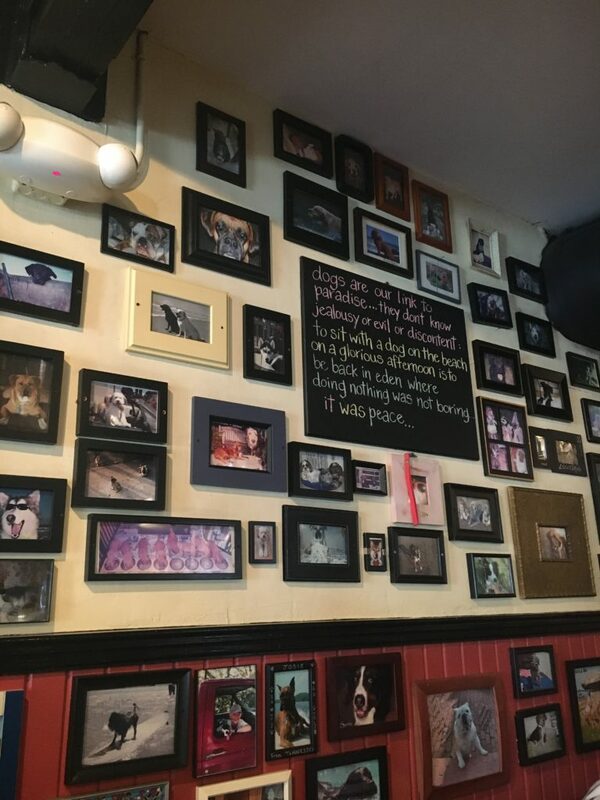 I am the biggest dog lover around, so I enjoyed the theme here. That night we wanted to try a brewery not far from where we were going to dinner. 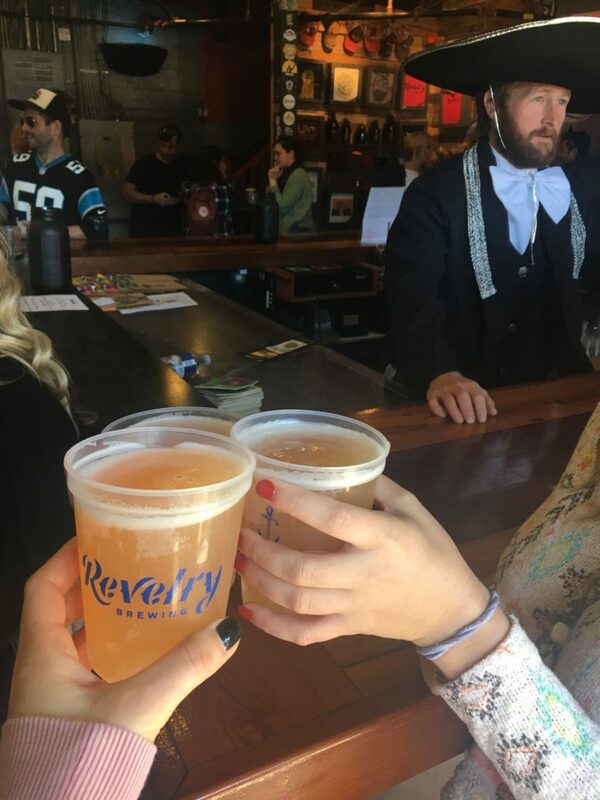 Revelry Brewing had some awesome craft beer to choose from. My favorite was the one brewed with Passionfruit and Guava. We shared two flights, each came with four beers which was perfect for us. We headed to our next stop, Leon’s, for a RIDICULOUSLY good meal. I had picked the fried chicken and the scalloped potatoes…my mouth is watering just thinking about that meal! There was a bit of a wait so we put our name in and walked to Pancito & Lefty for a cocktail and some chips & guac. 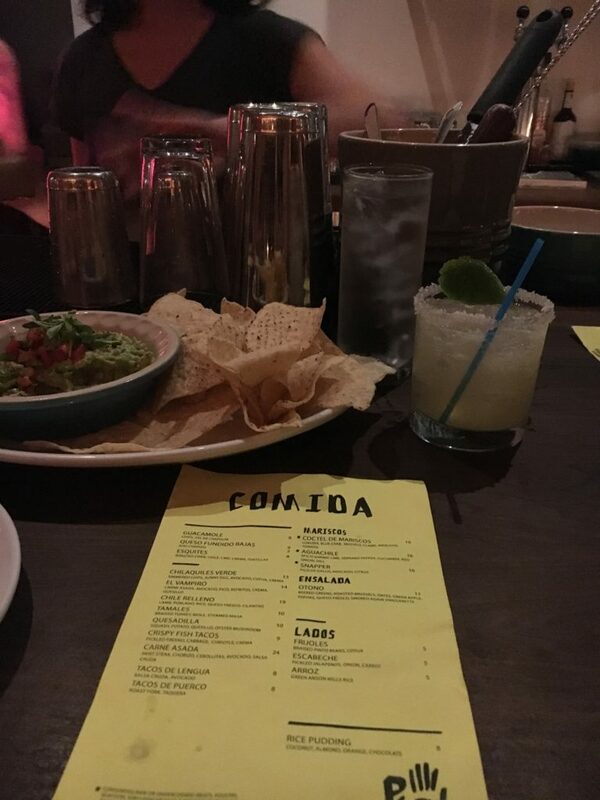 The original margarita was a good choice. After dinner we got an Uber and went to the Night Market. 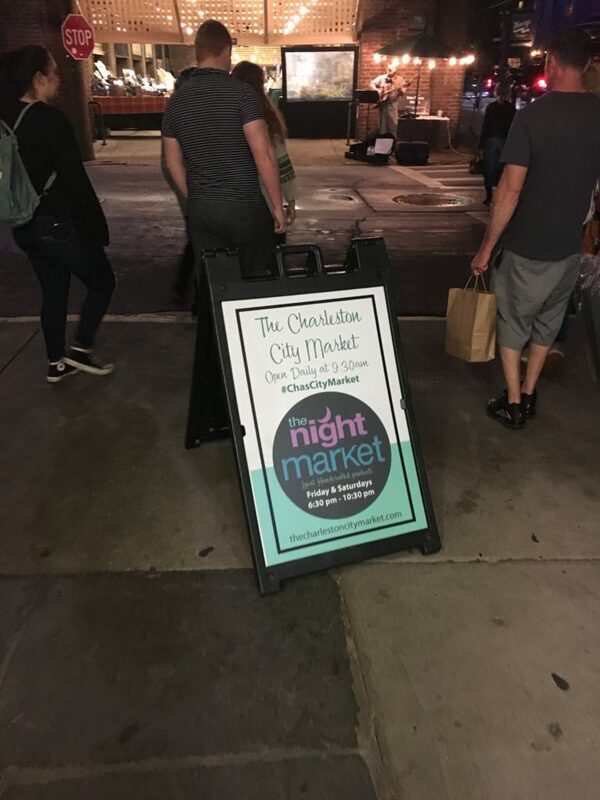 We got lucky as we went on a Saturday; the night market runs on Friday and Saturdays from 6:30-10:30pm. As soon as we strolled up I remembered being there when I was younger. We ended up going during the day as well. I’d say the vendors were a little more my speed at night. There were tons of local vendors selling their beautiful handcrafted goods, either way it’s worthy! We went to The Gin Joint and put our name in to wait for a table. 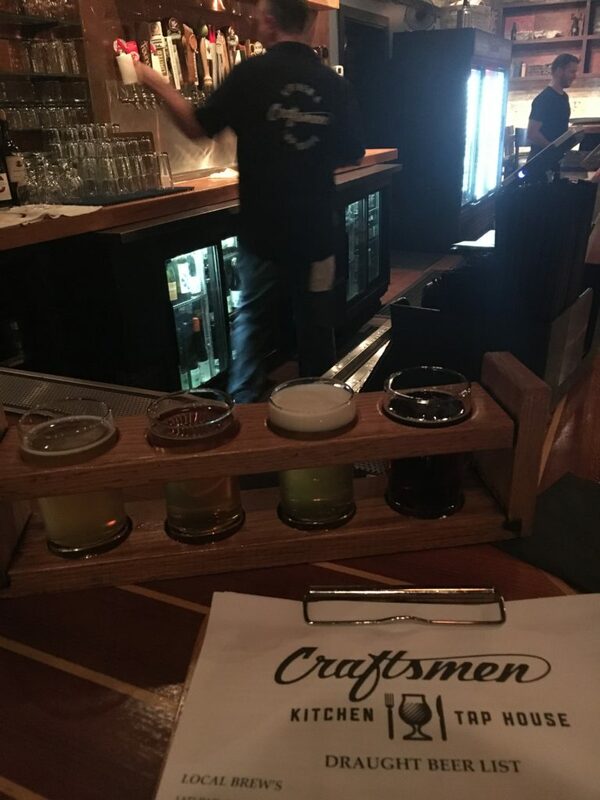 In the mean time, we stopped at Craftsmen Kitchen & Tap House for another flight. Holy cow, did they have a ton of beers to choose from. This is a beer lovers paradise. The food menu looked awesome, as well. By far, one of my favorite spots was The Gin Joint. It was so awesome, we went back again the next night. The option to order the “Bartender’s Choice”, was something that I had never seen. You pick any two words off of the menu and the bartender makes you something tasty. I went with a couple of different combos and was intrigued each time. On Sunday morning we got up and went right to the Sunday Brunch Farmers Market. The name alone is adorable and makes you want to get up early to go! Colleen knew the way to my heart by taking us there. From beautiful handmade goods to fresh organic veggies, there was so much to enjoy. Because we were there right around Halloween, there were a handful of owner’s that dressed up their pooch’s. It was great! This market was super family friendly with lots of activities for the kids. 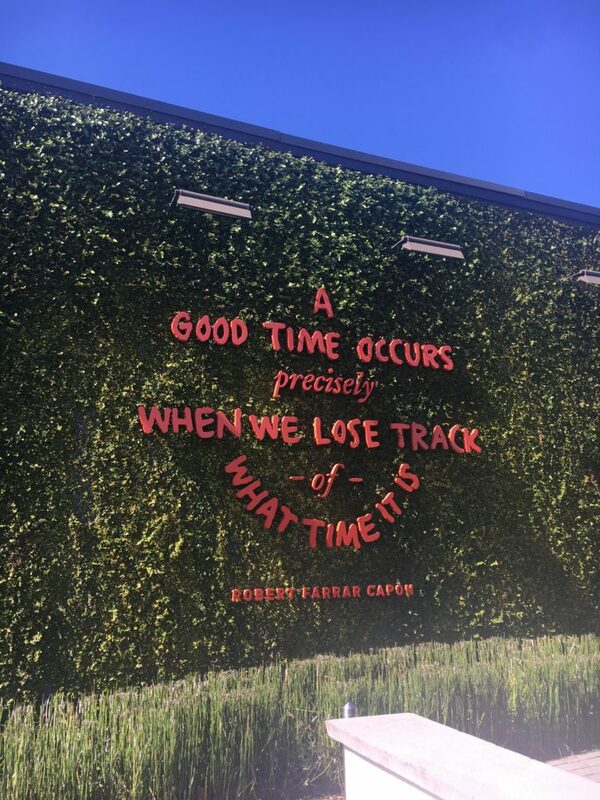 I’m a sucker for cute signs and quotes, this was one of my favorites. We picked Warehouse for brunch. It was fun to see it during the day and at night. Per usual, I got the eggs benedict and a bloody mary. Both were good picks. Revelry Brewing was having a huge block party and the day was gorgeous, so it was a no brainer to go there to listen to the DJ, enjoy some delicious beer and soak up the sun. It was highly entertaining to see a bunch of people in their costumes. 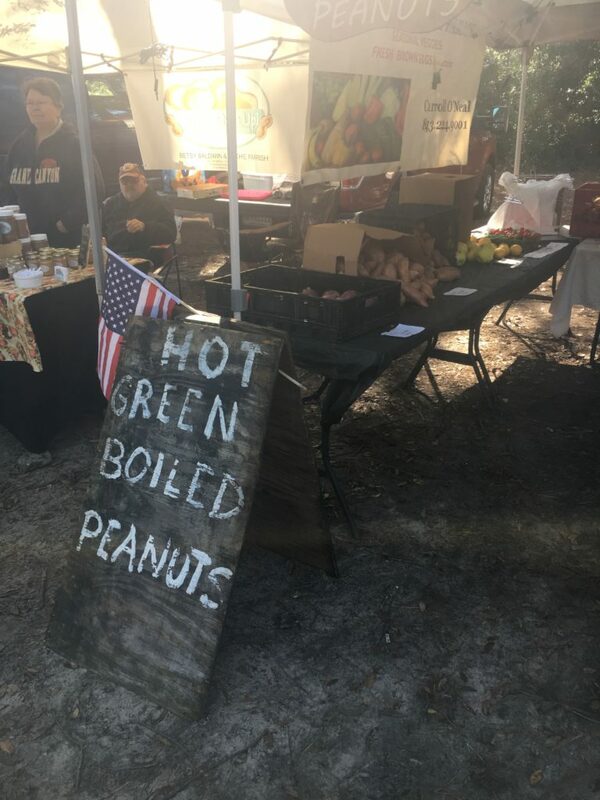 We went back to The Charleston City Market to see the vendor’s that were there during the day. Luckily, Callie’s Charleston Biscuits was open and ready for me to order a hot little cinnamon biscuit. Oh my gosh, if you come across this place, just do it!! And buy one of their adorable shirts as a souvenir. (Another souvenir idea that’s free and awesome would be a handful of Spanish Moss. That’s a story for another time!) Waterfront Park was just serene. We strolled the pier and took a seat on a bench to enjoy some live music. 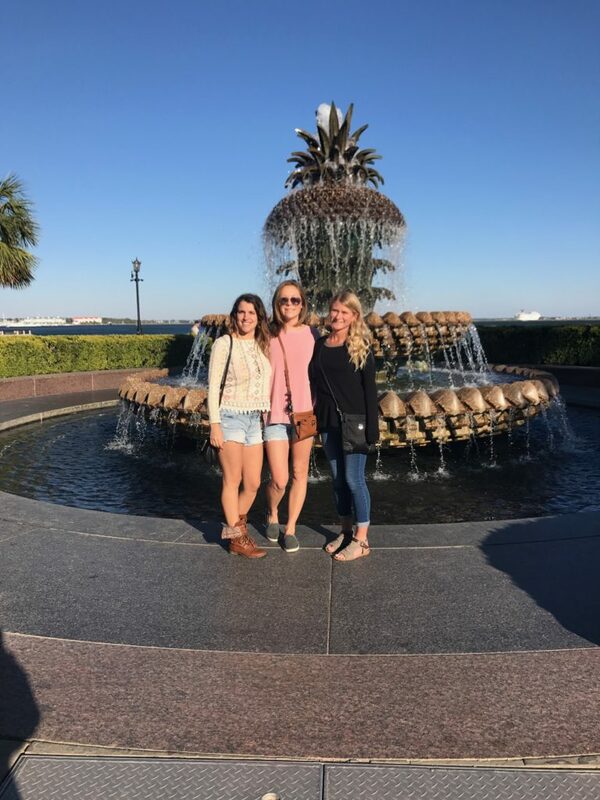 Colleen wanted to take us there to enjoy the beauty and to see the famous Charleston Pineapple Fountain. I highly recommend doing this. We left the park and walked to Rainbow Row to see the series of brightly colored houses. 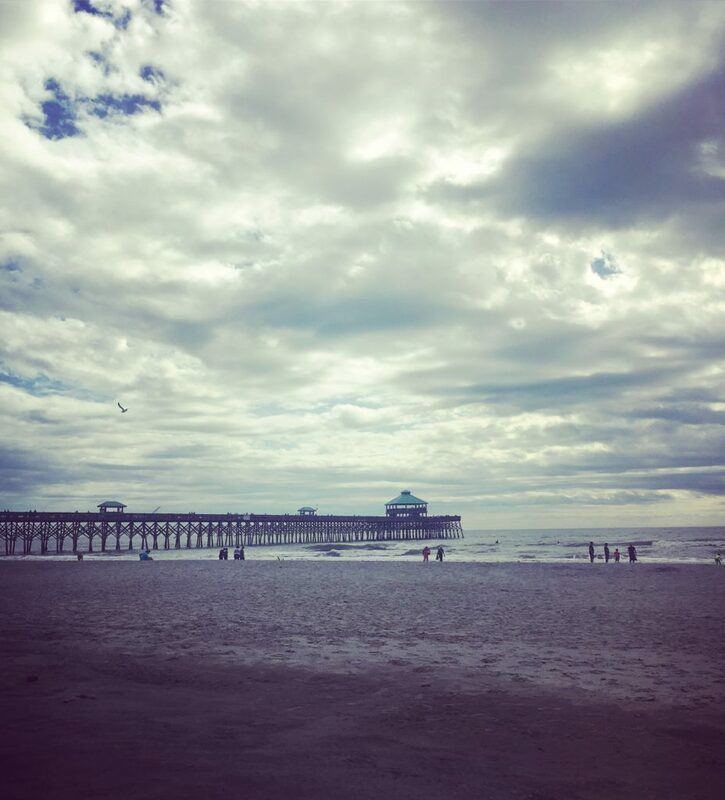 It was the perfect opportunity to enjoy the architecture and revel at Charleston’s charm. For our final night in Charleston, we picked Pearlz Oyster Bar for dinner. We were all about traditional Southern food on this trip as well as all the fresh seafood we could get our hands on. Pearlz was really good. I couldn’t leave without going to Carmella’s for dessert. Their tiny cakes were irresistible…we chose the cannoli cake and the peanut butter passion. 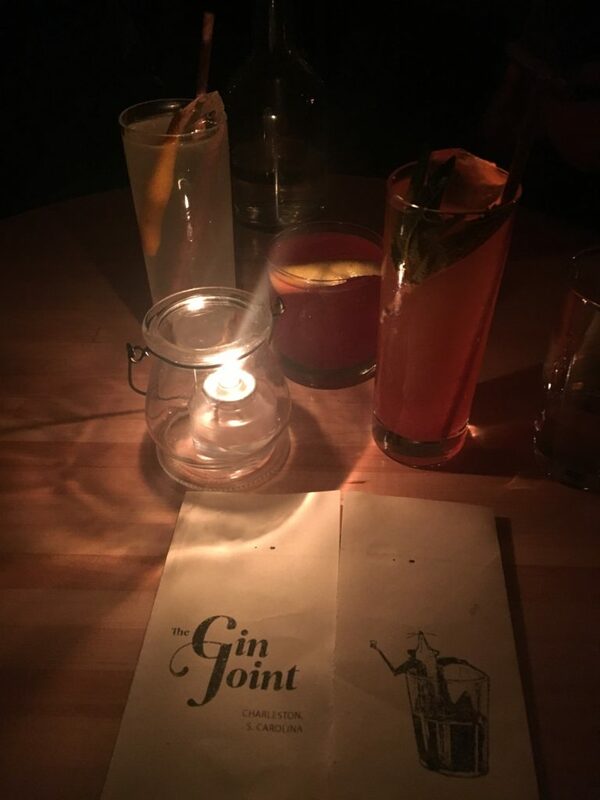 The Gin Joint was nearby, perfect for a nightcap and a really chill night. I cannot say enough how much I loved Charleston. The city is alive with so much charm and so much to enjoy. I would go back again in a heartbeat. 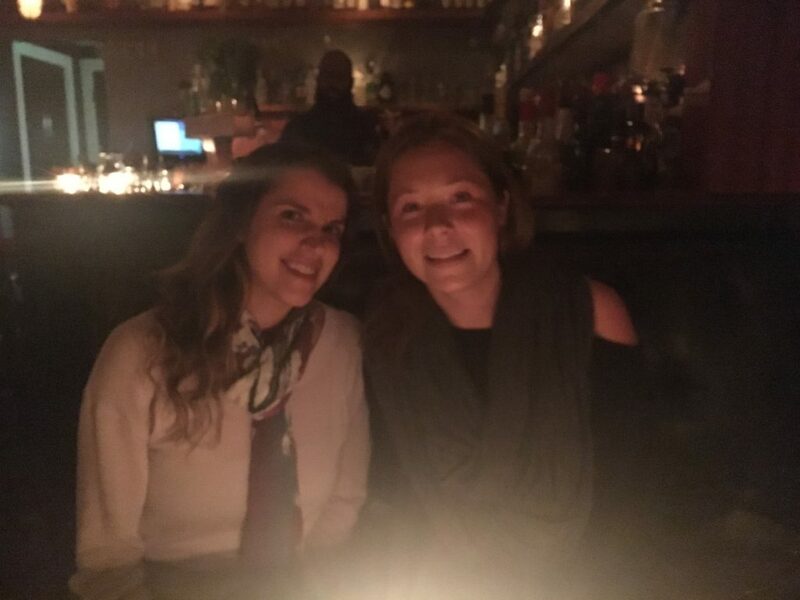 I have to give a huge shout out and a hug to my beautiful friend Colleen for being the best host and truly allowing us to enjoy every minute of our weekend together. Her friends were super welcoming and everything was just perfect. I definitely hope to visit again in the near future!